Tymon Mellor: Hong Kong was built from stone and bricks, all held together with a cement mortar. All these materials were locally made using the natural resources Hong Kong could provide. The New Territories are rich in clay, which over the years has been used for pottery and brick manufacturing. The use of air dried bricks for house building was common, and fired bricks have been built for special projects such as the construction of the Kowloon Canton Railway. In the 1933 factories return, eight brick works were identified in Kowloon, this had dropped to two by 1938. 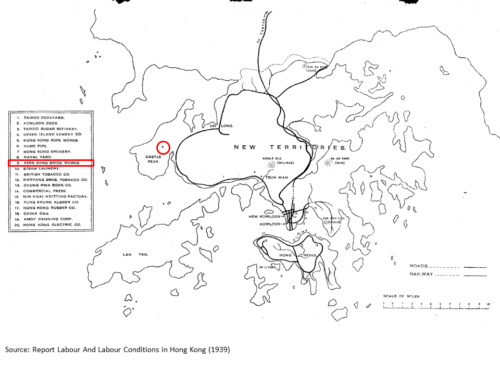 The 1939 report on “Labour and Labour Conditions”, identified two Brick Works in Kowloon and the New Territories. A map at the end of the report indicated the Keen Sing Brick Works to the east of Castle Peak [see articles below.] The second works is not identified. “Blue bricks are made in various parts of the Territory for local use, and in addition there is a growing export trade from works in the North of the Territory which send bricks by junk to Hong Kong and Canton. Very few tiles were made in the Territory ten years ago but now there is a large and successful business in them: the two chief brick works are at Muk Fu, near Sheung Shui on the Sham Chun river: each puts out about 75,000 bricks a month. 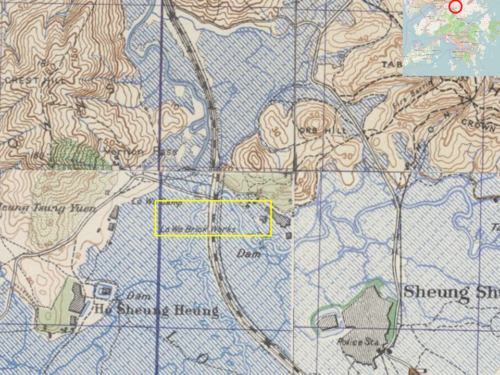 A review of a 1945 map identifies the Lo Wu Brick Works, to the north west of Sheung Shui. This may be the first works described in the 1912 report. The area was important to the British military, with the Lo Wu Camp located across the valley to the west. In 1927 the 2nd Battalion Scots Guards were stationed there and took photographs of the local landscape. These clearly show two chimneys associated with a brick works and a group of buildings. If you look closely, you can see a train passing at the bottom left of the photo indicating the works proximity to the KCR. The brick works were still on the 1957 map, but now the area is village houses and farm land. Was this possibly one of the first manufacturing companies to move to the Mainland? 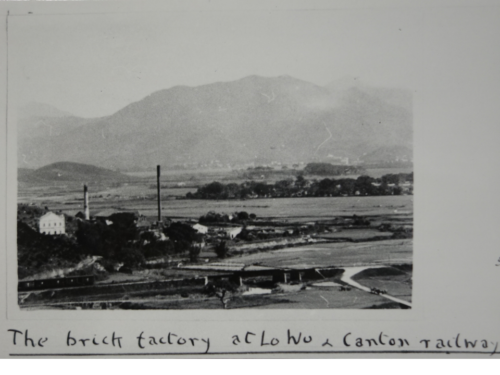 Hong Kong Public Records Office, Photo 8/25/149 Brick factory at Lo Wu and Kowloon-Canton Railway 1927. 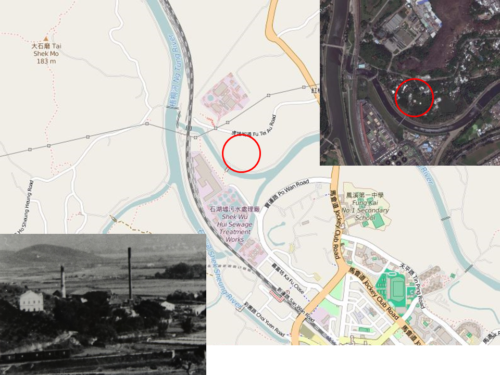 Brick Works, Brick Hill (Ocean Park) – the location of the HK Pipe, Brick and Tile Works?